February Wishlist - Pink Isn't Just for Wednesdays! Maybe it's the overwhelming feeling that spring is nearly here, or the rose tinted glasses I'm still wearing left over from Valentine's Day, but I have a real craving for the colour pink. It's funny how as a little girl I was obsessed with all shades of the colour; everything in my room was hot pink. Not to mention the hundreds of barbie dolls I was lucky enough to own, each dressed head to toe in the colour. But upon reaching my teens it became 'uncool' and 'childish' so I feel like it's definitely time to rekindle my love for the hue. 1. Havaianas Slim Women's Paisage in Beige (£26) - not entirely sure why these are described as beige as to me they're very pink! Depicting a beautiful beachy sunset, I'd love to set these off with a perfect pedicure to complete my look. 2. ASOS Lolly Brush (£6.50) - this novelty hairbrush made me melt, it's the perfect handbag accessory to fix your fly away hairs. 3. Limited Edition Spring Summer Nail Polish in Rose Red (£12) - fashionable bottle and gorgeous shade, why would this little beauty not be on my must have list?! 4. ALDO Hatchet Mini Tote with Buckle Detail (£35) - reminiscent of the iconic Michael Kors handbags, this ALDO tote is guaranteed to add a pop of colour to any outfit at a fraction of the price. 5. Topshop Lace Trim Ankle Socks (£3.50) - spring can be a little chilly whilst waiting for the sun to appear, these frilly socks would look cute peeping out of a pair of boots. 6. Pandora Moments Pink Multi-Strand Bracelet (£35) - I already own a Pandora charm bracelet, but this pink version is a chilled out yet cute alternative. 7. theBalm Cabana Boy Blush (£15.50) - a natural blush that will give you a soft warm glow, as an addict of theBalm products I really want to try this out for myself! 8. 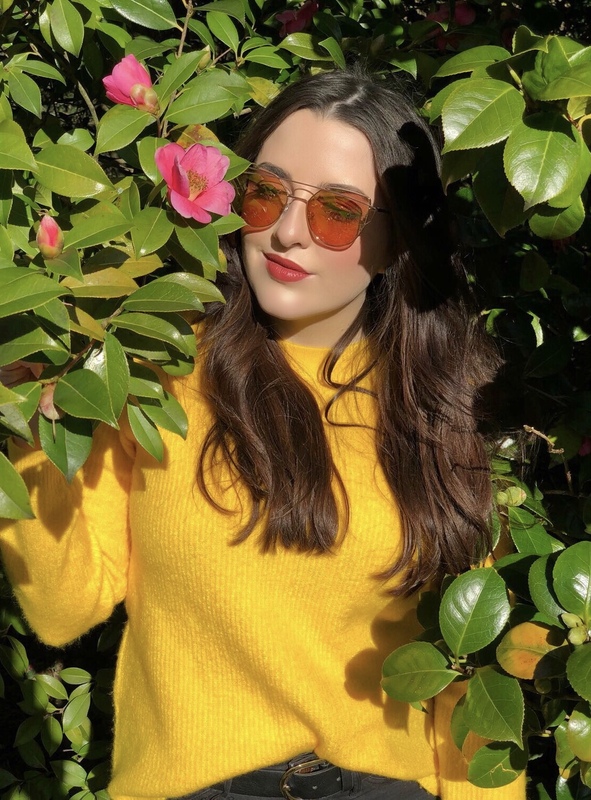 Topshop Large Aviator Sunglasses (£12) - see life through rose tinted lenses, these chic sunglasses in the classic aviator style will add a splash of spring colour. 9. Pantone iPhone Case in Candy Pink (£18) - whilst I'm matching all my accessories there's no reason why my phone should miss out on the action! This sleek, glossy case is a great little pick me up. 10. MAC Cosmetics Lipstick in Creme Cup (£15.50) - every girl needs to own a MAC lipstick in this shade and it's about time I picked mine up too! 11. Olivia Burton Wonderland Watch in Pink (£65.00) - I'd never have to worry about the time again with this luscious piece of wrist candy, a girl can never have too many watches! 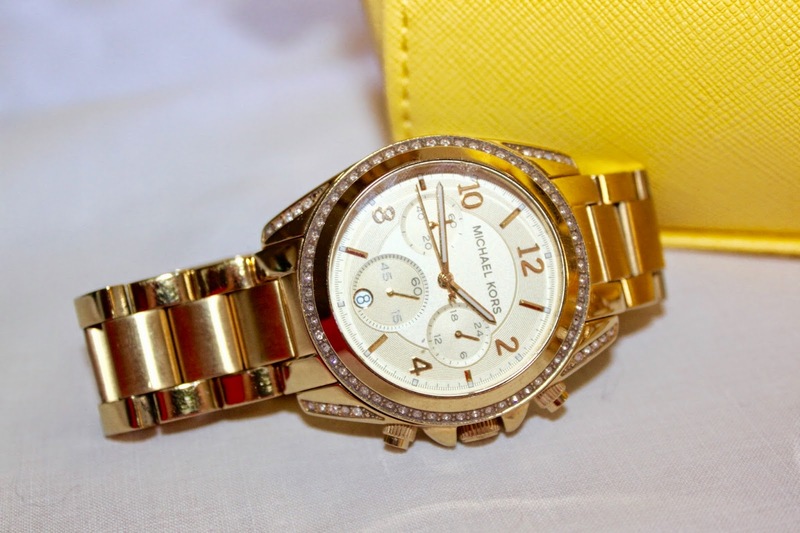 I hope you enjoyed reading my post, what's on your February wishlist? Primark Haul S/S15 Fashion Trends - Hello Yellow! It's that time of year again where it's still freezing outside but the fashion world are already telling us to start taking off some of our layers, and switch up our dark wintery shades for lighter, brighter colours. 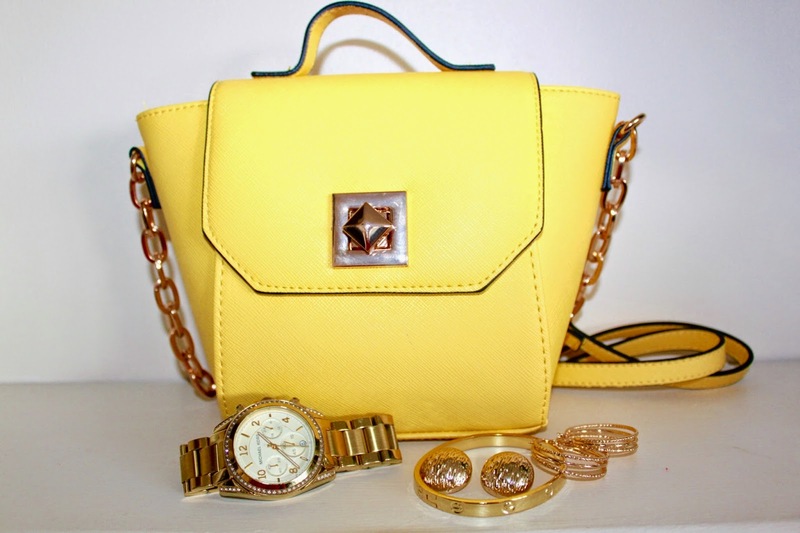 So I decided to inject a little bit of sunshine into my accessories and purchased this lovely lemon yellow bag from Primark. The colour yellow is definitely dominating the shops at the moment, with varying intensities of the shade from pale buttery yellows all the way through to vibrant neons. I'm particularly fond of this bag because of it's handy size, it perfectly fits my purse and other essentials but isn't large enough so that I'll end up carrying around a load of rubbish! The asymmetric shape is similar to that of the Céline bags, so I know that this bag won't be going out of style any time soon before I get a chance to use it. 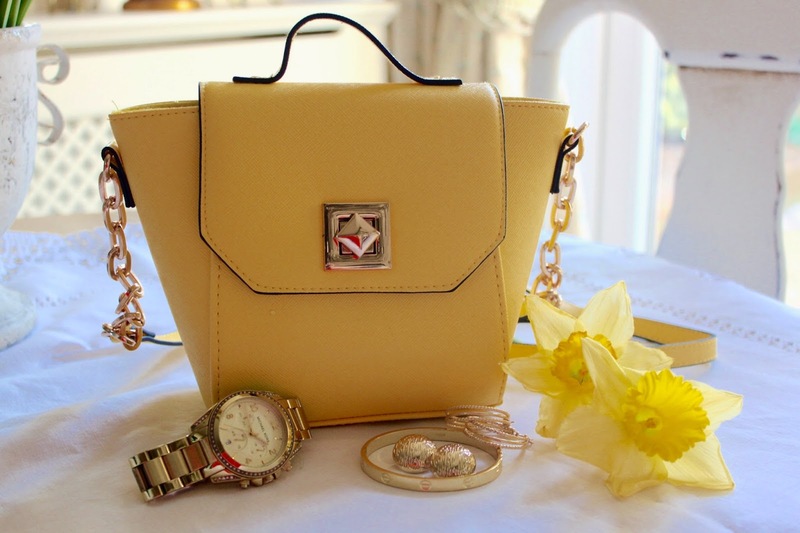 The lemon yellow shade is beautifully balanced out with a contrasting black trim and gold fastenings. 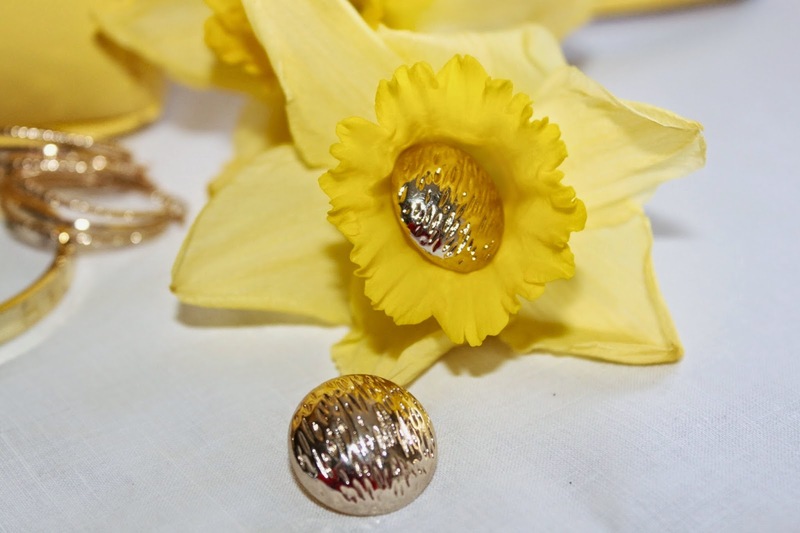 I think the gold embellishments are a really gorgeous alternative to silver and create a cheery spring glow. I also picked up these two pairs of earrings for only £1 each, I couldn't leave them there for that price and I think they will help to complete any outfit. I plan to pair them with my Michael Kors watch (an eternal favourite of mine) and my Cartier love bracelet, also in gold. I'm usually very reserved when it comes to purchasing bags, most of the time I stick to brown or black as I know that they'll coordinate with everything. But I think it's time I experiment a little bit with some of the lovely, colorful trends the high street has to offer this spring. 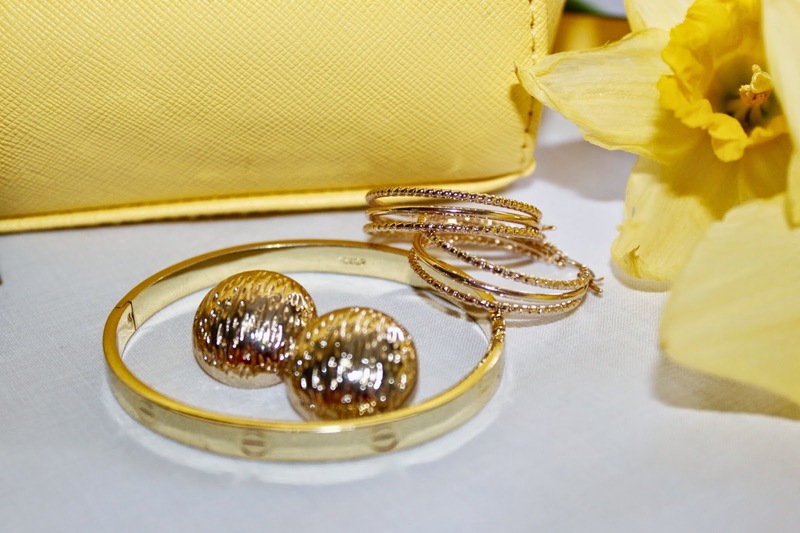 What are your thoughts on the colour yellow this spring? Or is there another colour that's caught your eye?